I got this M42 lens from a good friend of mine in PentaxForums. Too bad, I get a bit of oil in the blades but so far I don't run into shutter problems and the lens is in pristine condition and James has given me a nice matching lens hood to guard against flare. The lens is built like a tank and I used a genuine Pentax M42 adapter to use with my K100D body. This is one of the hardest manual lens that I have ever used. Test shots come out blurry due to mistakes on my part missing the right focus and the use of ISO 400 and aperture at f/2.0 for all test shots are taxing on the image quality. With more experience, I should be able to adapt to the lens. 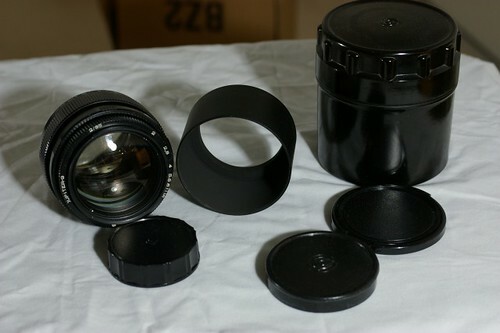 More difficult than other manual lens to use due to stiff focusing ring and design in aperture ring. Aperture ring is in front and there is an odd extra ring that allows one to stop down manually to the f/2.0 aperture for better focusing perhaps. Quite soft at wide open aperture but I find f/2.0 quite good for indoor without flash. My copy is an used copy without coating and it has a bit of oil on the blades. Few others noted a bit of oil on the blades and commented as normal for the lens. I get my lens hood from heavystar, an Ebay store with good reputation for lens accessories and others. I get the 49mm tele lens hood with a cap and I always have it mounted on my Jupiter for both guarding against flare and lens protection. try buying a split-prism focusing screen. it helps tons when manual focusing! they have rel. cheap (but good) modified nikon focusing screens at focusingscreens.com. made a world of difference for me, but you need light! Don't forget it's a -preset- lens. To use it you have to go wide open and rotate the prest ring (the one with the numbers written on) to the aperture you want to use. You aim to the target, compose, and, without move yor camera, you can act on the aperture ring, rotating it to the mechanical stop, it will go to the preset value. So, if you preset f8, you aim, compose and focus at f2, that is much easier, and rotate the aperture ring to the stop, you don't need to wacth to it. For the oil on the blades, It's absolutely normal on a preset lens. It's the same on mine and on other preset lens I own. And yes, for close ups it's quite easy to use and I feel a good ergonomy on commands, but when focusing to infinite it becames almost impossible to twiddle on the aperture ring. Thank you so much for the comment. Your inputs on oil are heard from others who are familiar with this preset lens. The preset lens is very good in providing the preset ring to allow easier focus in bigger aperture and also, it serve to the photographers room to experiment on a non-stop aperture such as something in between the f-stops. lay bhaari re raoo.. jamlay yeadya..!